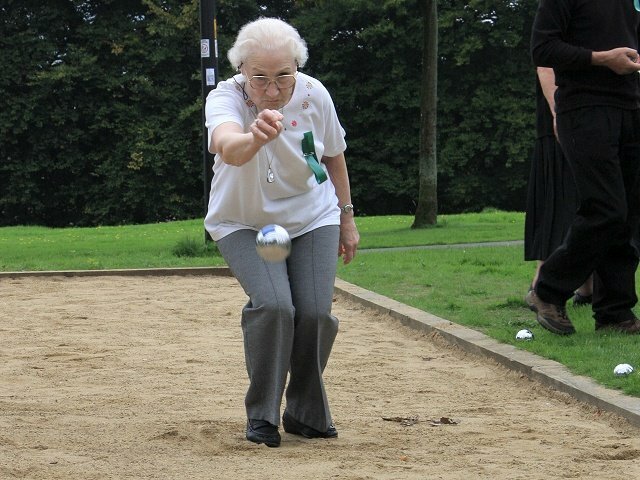 The Friends of Marple Memorial Park have had amazing success with their projects in the park, thanks largely to the great support from local people, other voluntary organisations and the Marple business community. You can read more about these successes here. Towards the end of 2015 Friends of the Park were contacted by Marple Local History Society about an historic WW2 plaque that had been donated to their archives by a lady called Julie Clay. 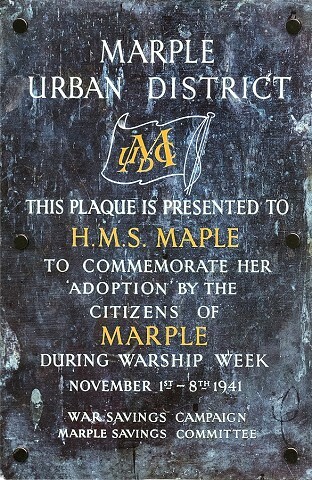 The plaque was made to commemorate the adoption of HMS Maple by the citizens of Marple after the community raised £75,000 during Warship Week in November 1941. Keen to put the plaque on public display, the society felt that Memorial Park was the perfect place and we certainly agreed with that too! We'll probably never be sure how the plaque found its way back to Marple but we do know that Julie's uncle, Bernard Mifflin, acquired it somehow and it spent the last 30 years in his garden. It's likely that the plaque was removed from the ship when it was scrapped in 1956. There is a page on MLHS's web site to explain in more detail the background and history of the plaque and HMS Maple. 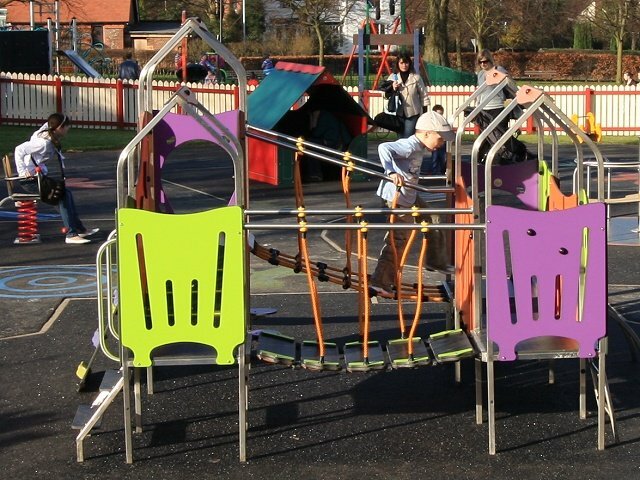 On this page we focus on the project to install it in the park and the fantastic community support that helped us to do it. 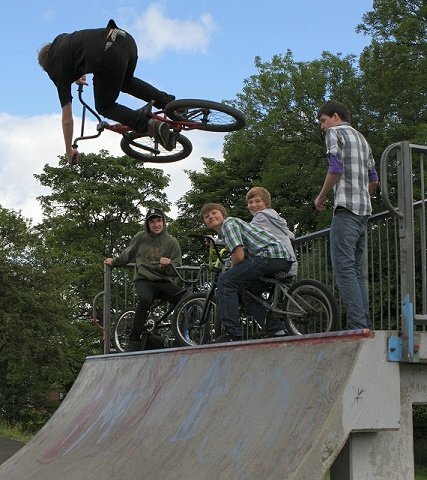 In 2011 Friends of the Park began a project to upgrade and extend the existing skatepark facilities in the park. We joined forces with Stockport Council and local skater Lewis Abbott, who campaigned to get the existing facility built back in 2000 and is still a skater today. We also gained the support of Marple Civic Society, Marple Vision Partnership and Marple Hall School. We consulted extensively with users and the local community and held a design competition tender. In April 2015 we gained planning permission to build a new £100k facility designed by Canvas Spaces Ltd. We started fund-raising in November 2012 and with huge community support from local groups and individual had raised over £50k of funding by the end of 2016. Thanks to another £50k of £ for £ Council match-funding we are now ready to start construction. Kärcher cleans Marple Memorial Park! 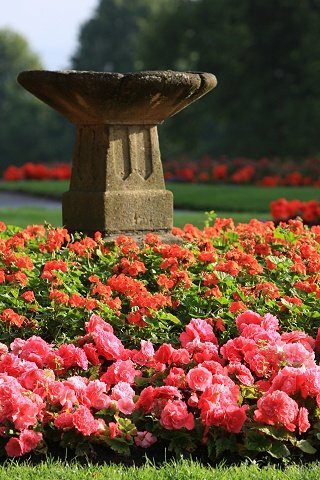 In June 2013 Friends of Marple Memorial Park won one of three top runners-up prizes in the "Kärcher Cleans Britain 2013" competition. Kärcher Cleans Britain, now in its third year, is a campaign which aims to encourage Briton’s to clean up their streets and the top prize was a visit from Kärcher's Clean-Up Squad led by TV's restoration expert Sarah Beeney. Although Sarah didn't come to Marple we did receive some fantastic prizes including a day-long visit from the huge Kärcher Clean-Up Squad and volunteers from Keep Britain Tidy. Local volunteers came along and joined in too and at one point in the morning we had more than 40 people helping to clean-up our park, which is our biggest volunteer day to date! In 2011 a member of Friends of Marple Memorial Park suggested at one of our meetings that we should do something in the park to commemorate the Queen's Diamond Jubilee. Separately, another member felt it would be a good idea to invite the local college's Horticultural Department and Students to get involved with hands-on work in the park and set the wheels in motion to see if this could be arranged. These two independent ideas have since metamorphosed into a brand new community project to refurbish the rundown flowerbed in front of the library, turning it into something much more interesting as a permanent display to commemorate the Queen's Diamond Jubilee Year of 2012. It had been apparent for many years that benches in the park were deteriorating and some were in need of more than the normal routine maintenance that they sometimes received from the council. 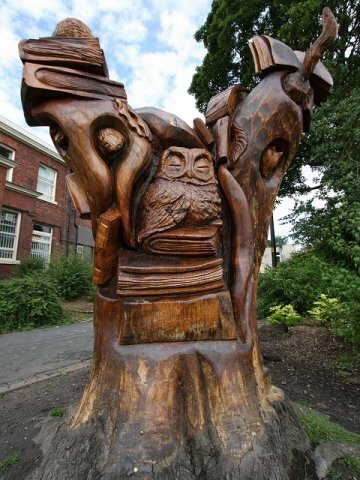 So in the spring of 2011 the Friends of Marple Memorial Park conducted a survey of benches in the park to identify the extent of the problem and to develop an action plan for dealing with the outcome. 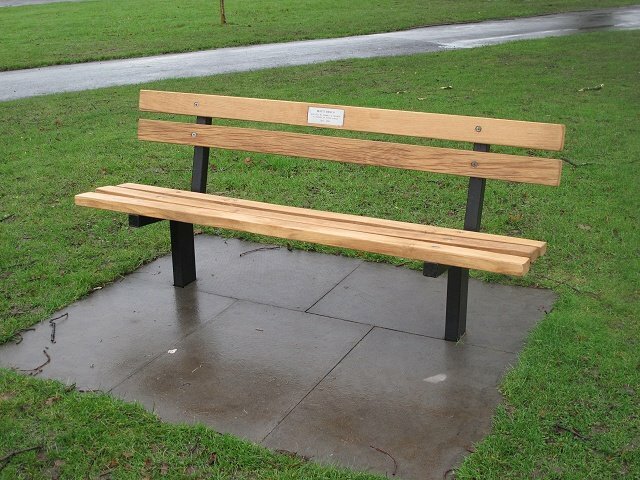 The survey revealed that many of the benches had been donated by families and friends in memory of a loved one, which is something that we felt was important not to lose. We therefore developed a policy of repair and refurbishment only for any existing commemorative benches but with the possibility of adoption and replacement of non-commemorative benches. We decided to encourage adoption wherever possible in preference to new commemorative benches being installed in the park. The main road entrance to the park from Stockport Road had significant infrastructure improvements carried out by the council in 2003/4 but by 2010, although the hard landscaping was generally still in good shape, some aspects of the entrance were starting to look a little bit tired, dilapidated and overgrown - especially the pedestrian entrance to the park itself. Friends of Marple Memorial Park decided that it was time to do whatever we could to tidy things up and make the park entrance a bit smarter and more welcoming to visitors. We started with the overgrown cinema shrub bed in February 2010 and we're making good progress but there's still lots to do. Read here what we've done so far and what we hope to do next. 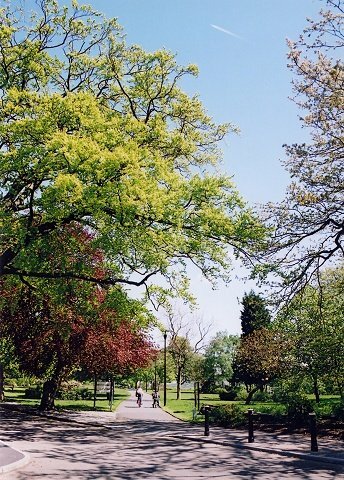 In August 2005 the Friends discovered that the oak tree next to the main path running through the park, and adjacent to the bowling green, was planted as part of the Queen's Coronation celebrations in 1953. A plaque was erected recording the event but at some point during the intervening years this had been lost. Initially it was proposed to simply replace the missing plaque with a new one but the idea developed into something more. Now it is possible sit and take in the tranquility of a game of bowls, the bustle and activity of the skate park, the beauty of the ornamental trees and flowerbeds, the War Memorial and, on a clear day, the magnificent views of the distant hills, all from the comfort of our "Coronation Bench".